Ok if you’ve been following along, you shouldn’t be surprised. I promised gluten free cake recipes, and I generally follow through. Unless I’m tired and having a bad week. In which case you just have to wait a little longer. Anyway, cake. This cake. Gluten free white chocolate mud cake. Short sentences much? I used to be a chocolate girl. Usually the darker and richer the better. But in the last few years I have discovered a new-found respect for the lighter flavours of white chocolate and vanilla. 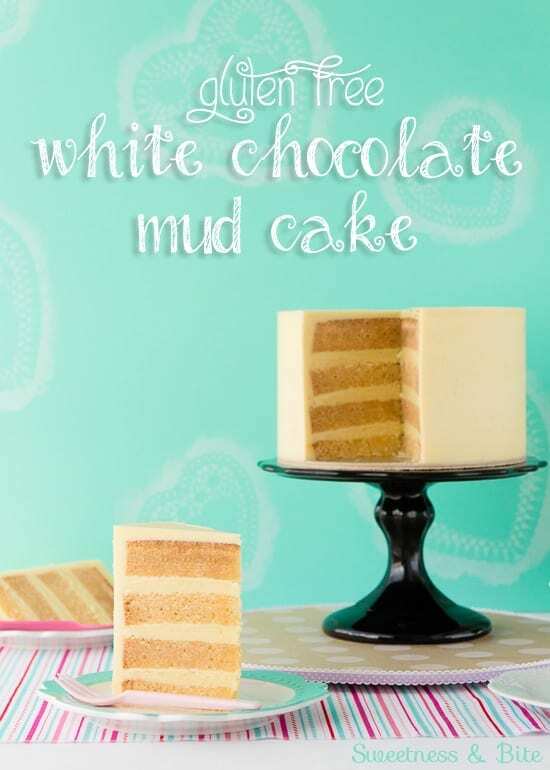 This mud cake is a delicious combination of the two, smooth white chocolate flavour with a hint of vanilla in a moist and dense cake. 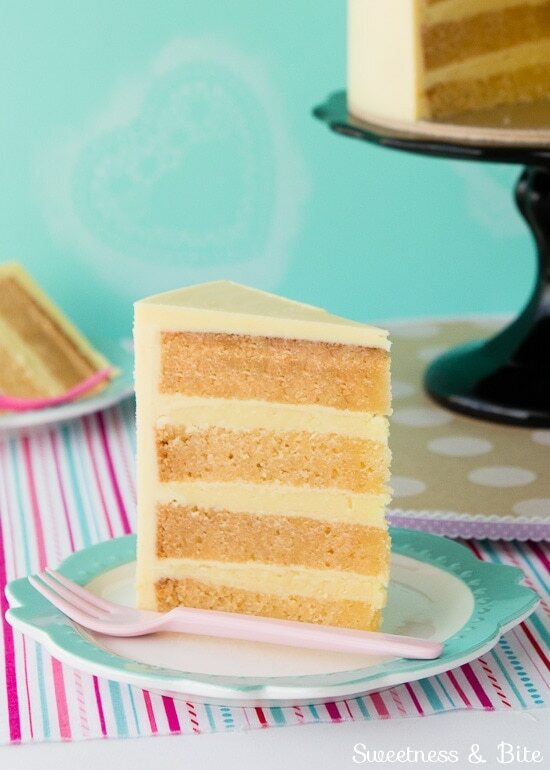 The key to this cake is to use a good quality white chocolate. One that actually contains cocoa butter, rather than a compound chocolate that uses oil instead of cocoa butter. ‘Cause white chocolate is already walking a fine line to be classed as chocolate, and compound chocolate is really just vanilla flavoured sugary fat. Have I convinced you? And then the vanilla, dry ingredients and eggs get mixed in. Easy. I didn’t adjust the batter amount at all, so this makes a very tall (approx 4” high) seven inch round cake. The reason I didn’t want to make a shorter cake is that white chocolate mud cakes get a rather brown crust. Even with baking strips, (and I used baking strips with twice the usual thickness of wet paper towels), you can see that the crust is still a lot darker than the rest of the cake. Because I’m all about cake looking and tasting equally good, I like to trim off both the top and bottom crusts of the cake. So I kept the full sized recipe to make sure I had the height to compensate for my compulsive trimming habit. If you’re not like me, then you can scale down the recipe (or use an 8″ tin instead). To make the slices look prettier, and to give enough room for ganache on the sides of the cake, I trim off the darker edges of the cake as well. 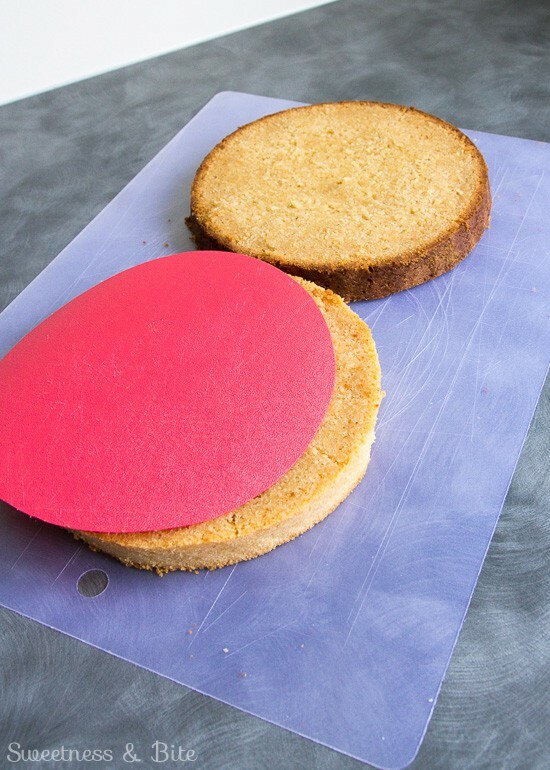 To make it easier I’ve made these templates from thin plastic cutting boards- I just trace around a cake board and then cut out the circle approx. 1cm/ ½” inside the line. Then I just place the template on each cake layer and use a small serrated knife to trim them. I made this a plain white chocolate cake obviously, but you can totally add back in the citrus zest from the original recipe for a lovely zesty cake. 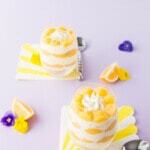 You can either use all three zests (lemon, lime and orange) or pick one for a single fruity flavour cake. 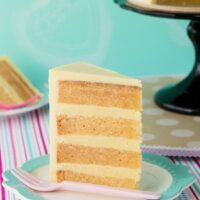 White chocolate ganache is the perfect filling for this cake, and once again it’s important to use a quality chocolate. Kiwi readers will be able to tell I love Whittaker’s chocolate in all shapes and forms. 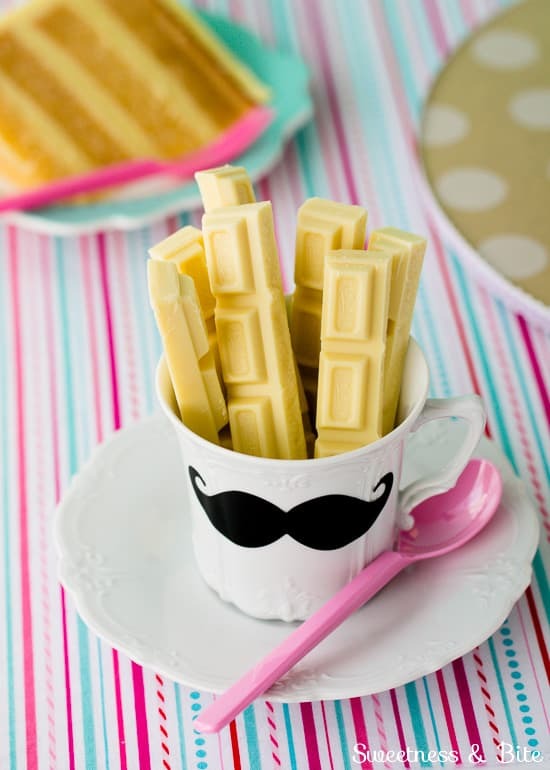 And I also like it in moustache tea cups, but that’s kinda beside the point. This cake is not quite as dense as the dark chocolate version, but it is still suitable for most decorating uses, including a bit of light carving. I wouldn’t go making a life-sized cake version of your pet alpaca out of it, but with some chilling and the use of ganache you could make most shapes out of it. You can use the CakeOmeter or the CakeOmeter app for iPhone/iPad to adjust the recipe for the tin size you want. As always, if you’re new to gluten-free baking, check out my gluten-free cakes for decorating post for tips, tricks and some more recipes. Yield: Makes one 7 inch round, approximately 4 inch high cake. 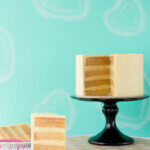 A moist, dense cake with delicate white chocolate and vanilla flavours. Suitable for covering in fondant, tiered cakes, lightly carved cakes, and decorating using the three day timeline. Preheat oven to 160° Celsius. 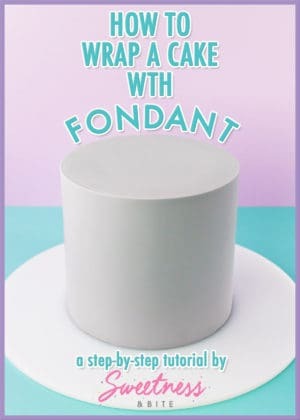 Line the base and sides of a 7” round (at least 3” high) cake pan and make a baking strip and foil lid. If your oven gets quite hot from the bottom element, place a heavy baking sheet on the rack below the one the cake will go on. In a medium bowl, sift together the flour, baking powder and xanthan gum. Whisk to combine well. In a large, heavy based saucepan, heat the milk and butter over a medium low heat, stirring occasionally with a wire whisk until the butter melts. 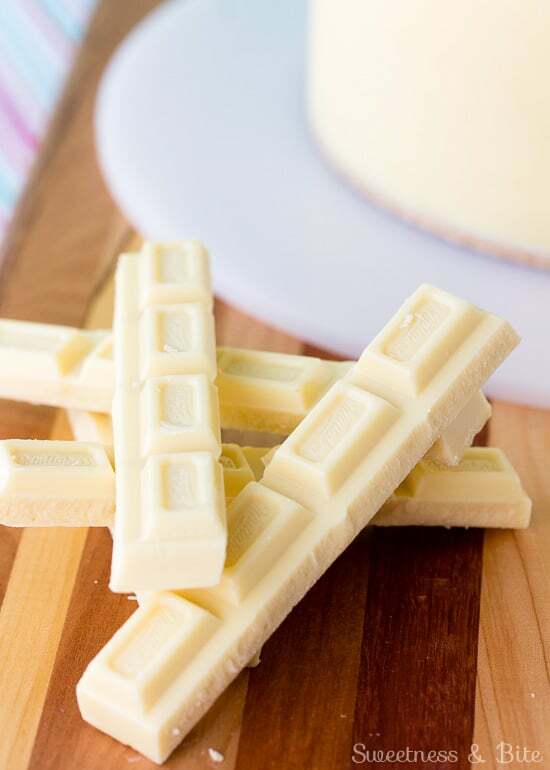 Add in the white chocolate, and stir until the chocolate has melted. Add in the sugar and whisk until the sugar has completely dissolved (this could take several minutes). Remove from the heat and stir in the vanilla extract. The liquid mixture now needs to cool until you can comfortably hold your finger in it. You can either transfer the mixture to a large heatproof bowl to cool it faster, or you can leave it in the pot and wait a bit longer for it to cool. When cool, add the dry ingredients in three additions. 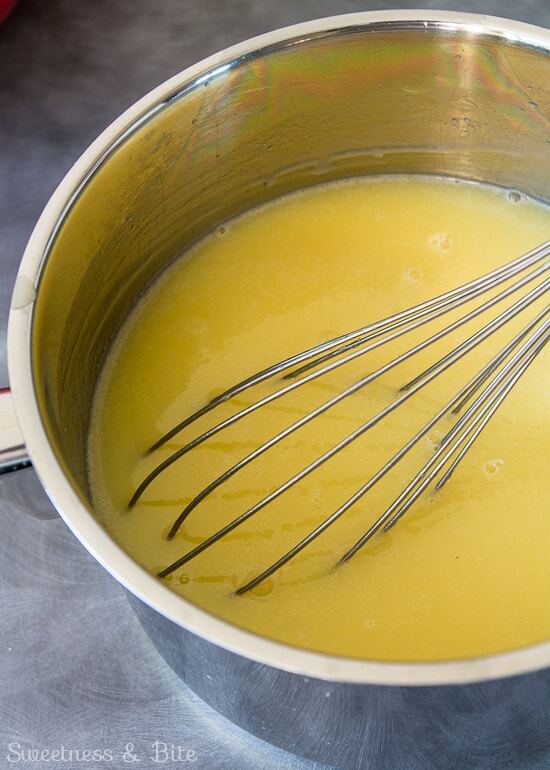 Mix with the whisk, but use a folding rather than whipping motion to avoid air bubbles. 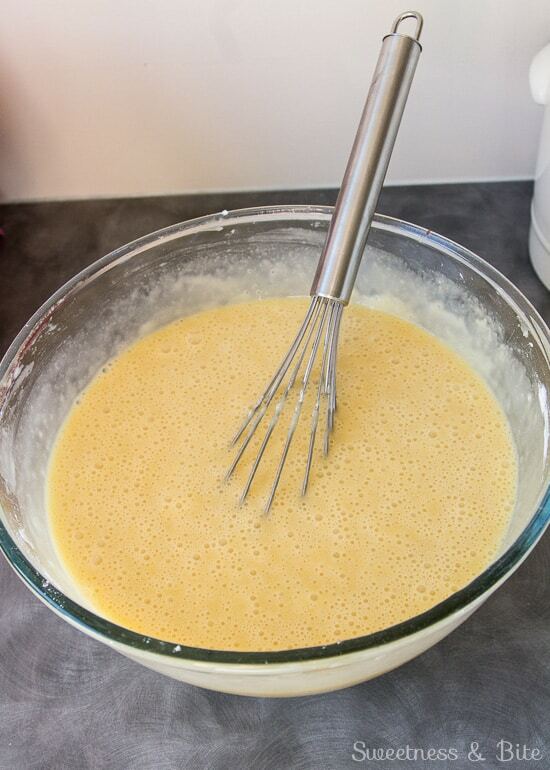 Whisk the eggs together with a fork and add to the batter, mixing again with the whisk. Leave the batter to sit for a minute to allow bubbles to come to the surface. Pour the batter into the prepared pan and bang it on the bench to remove any large air bubbles. Place the foil lid over the top and bake for 2.5 – 3 hours. To test if the cake is done, use a thin skewer. When the skewer comes out clean, insert a thin bladed knife into the middle of the cake. When that comes out clean or with only a few crumbs attached, the cake is done. If you have an instant read probe thermometer, the centre of the cake should be at least 99°C. 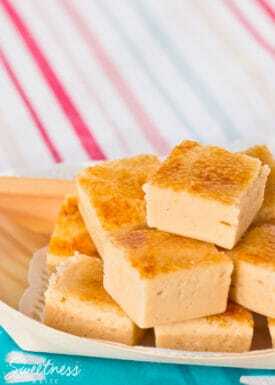 *I used 200g tapioca flour, 170g brown rice flour and 50g potato starch. Remember that if you use different flours than I have, your results may vary from mine. Check out my gluten free cake post for more information. If using a boxed gluten free flour blend that contains a gum ingredient, omit the Xanthan gum from the recipe. Made this today for my birthday! It was fantastic! Oh yay, I’m so glad to hear that! 🙂 Happy birthday! Hi. I’m just making this and my tin is 8″ and 2.5″ inch high. Is this going to work or should I do 2 tins? I was just wondering the bake time for cupcakes, please? Do you keep the temperature the same? Do you double your flour ratio and then use what’s required for the cake? The ingredient list says 420 g but your blend is 330 g. Thank you! Looking forward to trying this out. Thanks so much for letting me know! I’m usually very meticulous at checking my recipes. Ooh thanks for the update – baking this tomorrow!!! Hey, this cake looks amazing but I was wondering if it’s ok to freeze it? would it ruin it for shaping? Thanks for positing such comprehensive recipes btw, certainly makes things easier! Awesome, thanks very much 😀 Definitely gonna give this one a go! I need to make an egg free white choc gluten free cake.. what would you use in replace of eggs? Wow, I’m surprised this requires 2.5-3 hours to bake! I have baked many gluten free cakes, in two or three pans (to make 2 or 3 layer cakes) for the typical hour and they are done. This recipe sounds amazing though! So, I took the time to convert all of your measurements to US cups, and if I were to make mini cupcakes of this recipe I believe I should half? everything for 40 mini cupcakes. Hi Kim! It’s not the fact that this is a gluten free cake that means it takes a long time to bake. All Australian-style mud cakes that are typically used for cake decorating are baked for a long time at a low temperature. This ensures that they are baked right through to the middle before the outside dries out, and makes sure they stay lovely and moist. 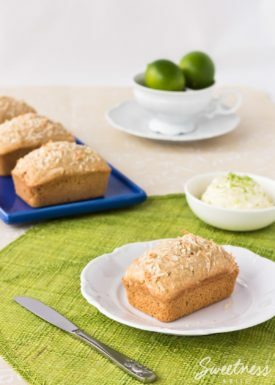 This recipe also makes a much higher cake than many traditional recipes. But you can certainly bake it in several smaller pans and it will take less time. I sometimes split it into two pans, but I prefer to do it in one, it is more moist and I only have to cut off and discard (or eat!) one top crust when I level it. Then I split it into four layers before filling it. thanks. Will have a go at it soon. I was wondering if this is an extremely moist white choc mud? Also it doesnt seem to have alot of white choc as opposed to the other ingredients?? Thank you so much for replying so quickly! Brilliant!Can you taste the difference with it being gluten free? In this recipe it’s gluten free plain flour. 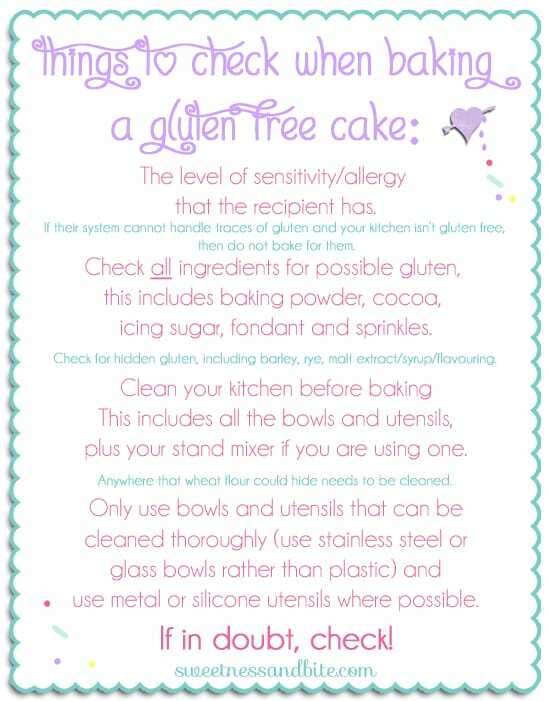 If you don’t need it to be gluten free then you can substitute it with regular plain wheat flour. Hi, Just wondering what the crumb should look like. Will it be more pudding like and sticky then a normal crumb? I’m not sure if I’ve not cooked it long enough as the crumb is very dense and after a few days it’s very wet looking. As I want to use it for a wedding cake it needs to be perfect and last a week crumb wise. Thanks! Just wondering about the foil cover on top. Do you take it off at all during baking? I ask because you say to let cool for 30 mins then put a foil cover on. This looks great! I was wondering if I could add champagne to it for a twist? Should I omit some of the milk? Hello, I ended up making this yesterday. I’m not sure what went wrong, I used the same flours and baked it for 3 hours with baking strips, it looked perfect on the outside. I cut it this morning and its definitely not cooked. The sad part is the edges taste phenomenal. Just not sure why it didn’t cook through, it sort of looks gummy and all the way through, not more gooey in the middle just like a gummy cake. I might try again when we move to a house with a better oven (ours is pretty old). I think this might be a recipe for confident cooks. Thank you anyway its a pleasure to see how beautiful your cakes are. Hi Sal, my apologies for my delayed reply, I’ve been on holiday and had no internet access. I’m sorry to hear your cake didn’t cook through properly. It could definitely be an issue with your oven, when our oven was having thermostat issues my mud cakes were coming out with gummy bits. I couldn’t figure out what was wrong until I bought an oven thermometer and realised that the oven was heating to the right temperature, but after half an hour or so it would suddenly drop the temperature quite dramatically (by 50 degrees or more) and that’s why the cakes weren’t cooking. Once we got a new thermostat they started coking just fine again, although I still don’t trust it and always use an oven thermometer when I bake. If you can get your hands on one that might help. Also, have a look at my post on checking that a cake is cooked all the way through as mud cakes can be notoriously hard to check for doneness. They seem cooked, and then when you cut into them you get a nasty surprise. I’m pretty sure that’s happened at least once to everyone who has baked a lot of mud cakes. It’s certainly happened to me many times 😉 I’d definitely try the oven thermometer though, if you can rule out the oven temperature as the issue, we can troubleshoot some more. 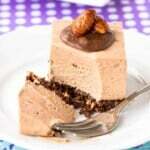 I would like to try this recipe as I have a cake order for a gluten free white choc mud cake. I have bought the white wings gluten free plain flour. It contains tapioca, rice flour and thickener (464). I was wondering if I would need to add the potato flour and the xantham gum to it? Hi Emz. I suggest you just use the white wings flour and leave out the xanthan gum. I haven’t used the flour before (it’s not sold in NZ) but I chatted to another reader a while back who had made my dark choc mud cake using that flour and they also added the xanthan gum and their cake turned out quite gummy. You could also still use the potato flour if you wanted to – it is really good for helping to keep the cake moist. But the white wings flour is marketed as a direct replacement for wheat flour, so hopefully it will work that way! My question.. I made too much batter, and would like to maybe try to make another 6″ round tomorrow after my other 6″ rounds cool overnight. Is it okay to put this in the fridge overnight and bake tomorrow? Does it keep well? I know it is best to use it right away, but would love to make a taller cake if it can wait until tomorrow. Thank you for your speedy reply and all your help! I would love to make this cake for my daughter’s 18th birthday, however, she wants a square cake. If I stick to your recipe, what size square cake tin would you recommend. Note that I probably wouldn’t make a layer cake, but just one cake. Also, what icing would you recommend? Buttercream, ganache or fondant? Your cake looks amazing, by the way. Hi Jo-Anne. 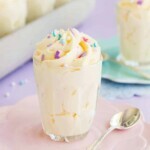 You can use this same amount of cake batter to make a 6″ square cake, which will be about 3.5 – 4″ high. To make a 7″ square, you can multiply the recipe by 1.5, and to make an 8″ square you can use double the recipe. I would definitely recommend using baking strips when baking a square mud cake, as the corners can dry out a lot before the centre of the cake is done. The baking strips will protect it and help it cook more evenly. Hello Natalie. Will this cake work well as a sheet cake? I’m looking for a recipe for my son’s graduation cake. Also, can I use egg replacer? My son also has an egg allergy. I have made this cake on several occasions and people love it. I just wanted to know I need to make this cake for a 10″ tin I’m thinking of making two separate batches then mixing it togethor. Is this cake suitable to be made in a bigger size? Excellent recipe, thank you! Mine just came out of the oven, looks perfect! Very even in colour and texture. Looking forward to tasting once it cools down. Hi, this cake looks amazing and I want to make it for much loved colleague. I want to bake it in 3 6″ pans. Any suggestions for baking time? Any help would be greatly appreciated. Thank you. Susan ? Hi, this cake looks amazing and I want to make it for much loved colleague. I want to bake it in 3 6″ pans. Any suggestions for baking time? Any help would be greatly appreciated. Also what temp reach on a candy thermometer to indicate it is cooked! I made this cake for my daughter’s 21st birthday and it was a huge hit! I do a little decorating for friends and family and they request this cake over a non glute-free cake. 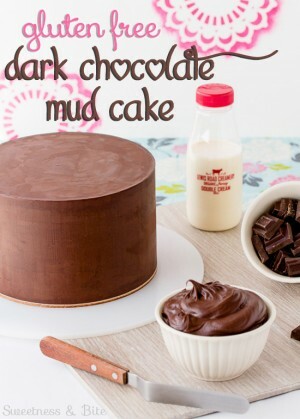 It is by fa the best mud cake I’ve eaten…. Thanks so much for making my gluten-free life! Hi! I want to try out this recipe for a family party in 2 days, my only issue is that i don’t have xantham gum or gluten free plain flour, would the recipe turn out okay if i just use plain flour and no xantham gum? Also i want to make the same amount of ganache but im thinking it might make the cake too sweet :/ was this the case when you made it? Hi there, just wondering if the Rice Flour can be white rice flour instead of brown rice flour? I’ve just opened a box of McKenzies Rice Flour (made from white rice) and it feels slightly gritty compared to normal flour. And one other question… is potato starch the same as potato flour? Thanks so much! Hi Indis, I haven’t had a chance to try this with any egg replacements, and I haven’t heard from any readers who have. However I’ve heard from a few who have used purchased egg replacer in my dark chocolate mud cake and they said it worked really well, so I can’t think of any reason why it wouldn’t work in white choc mud. The only thing I can think of with flaxseed gel is that you’d be able to see bits of the seeds in the cake. But if that doesn’t concern you then it could be worth giving it a go 🙂 Hope that helps. I love your website! 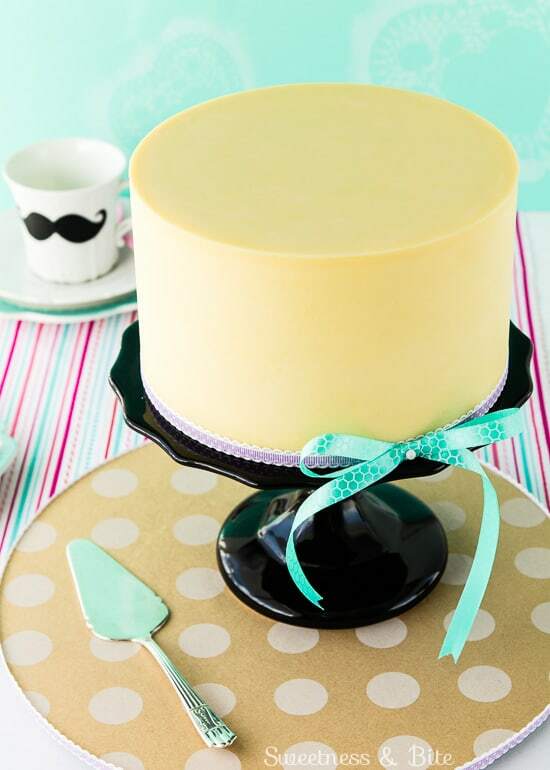 Your tutorials on covering a cake in fondant and perfect vertical buttercream stripes are genius. I’m celiac, so haven’t eaten gluten in 8 years. While I’m an avid baker, I only recently started to bake gluten free–I was overwhelmed by the many challenges. I really want to bake a gluten free cake, but I find xanthan gum does not agree with me. And too, many in my circle are open to eating some gluten free, but cringe at some of the commonly used ingredients like xanthan gum. For bread, I’ve used psyllium husk, chia seeds, flax seeds, egg whites as a replacer for xanthan gum. In pie crust, I’ve had success with cream cheese and pectin. But I’m stumped as to what might work as a xanthan gum replacer in cake. If you have any suggestions, I would be most appreciative. I usually make family birthday cakes and other occasion cakes with “normal” flour but as I have recently been diagnosed with a wheat/gluten intolerance I don’t get to eat any of them. I have just done a “test run” on this using half the recipe in 2 x 8 inch sandwich tins, It rose beautifully and is absolutely delicious and, unfortunately, very moreish!! I will be making the full recipe in a full size 8 inch round cake tin for my granddaughter’s 1st birthday in a couple of weeks. How many days in advance I could bake this without needing to freeze it? I was hoping to bake Thursday night for a Sunday morning party. I’d prefer to use the ganache to decorate as a drip cake rather than a smooth finish as per the picture, would this work to do the edges and layers smooth with a drip down from the top? Could I do the ganache the day before and it would be ok or does ganache need to be done on the day? Hi Lisa. This cake keeps really well, you can absolutely bake Thursday for a Sunday party. As long as the cake is stored well-wrapped and in an airtight container before ganaching, then once the ganache goes on it’s basically airtight so there’s no worry of it drying out. Yes you can use the ganache around the edge and then do a drip. If you haven’t done a drip before then have a look at this post for some drip tips. 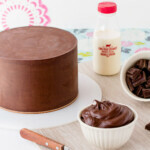 The ganache can be done the day after the cake is baked, or any time after that. I’d suggest baking Thursday, ganaching Friday, and depending on what else you’re decorating it with it could be finished off on Friday or Saturday. Hopefully that has answered everything, but if not let me know 🙂 Good luck! Thank you so much for your reply. I won’t be able to ganache Friday but will aim for first thing Saturday. I’m excited to bake this cake! What was baking time and temp for cupcakes? Ive made this cake a few times added raspberry and lemon filling , its amazing!! Hi Natalie. A friend has asked me to make her a white mud, gluten and dairy free. 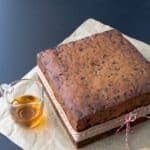 Could this cake be made with dairy free butter and milk? Just wondering if this recipe works for cupcakes and how to change the procedure in doing so. if i halved the recipe, what is the cooking time. Should it be half the time too? Hi, I made this cake today and it’s delicious! I want to make it as a 10 inch cake so I know that I should double the recipe but how long should I bake it for? 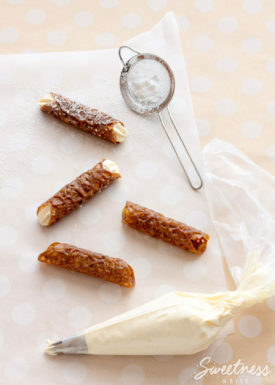 Hi Natalie, do you think this recipe would work with egg replacer, DF white chocolate and DF butter substitue, for an egg and dairy free alternative? Or am I tweaking too much? Hi Robyn. 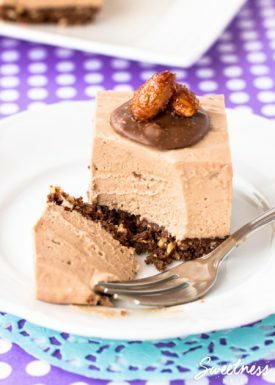 I know some of my readers have had a lot of success with this recipe using dairy free alternatives, and I have heard from a couple who used egg replacer successfully in it. I’m not sure if anyone has let me know they’ve done both though. I’ve been searching back through comments and messages because I thought someone had, but I can’t seem to find anything. 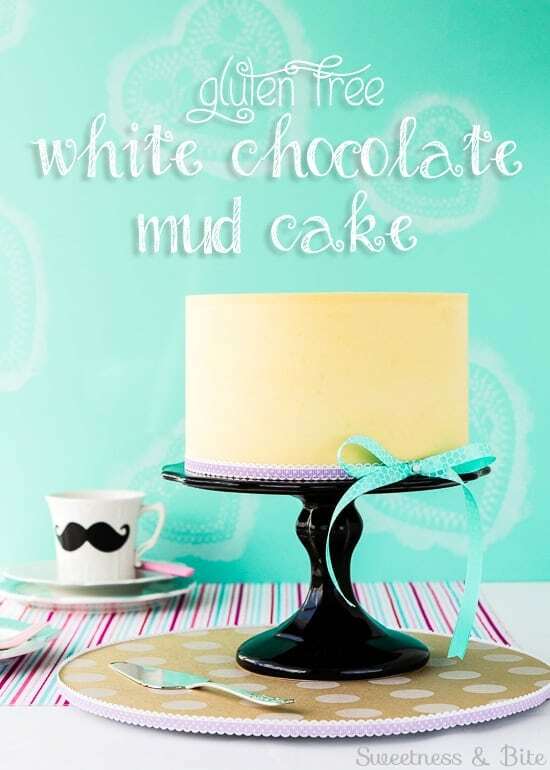 I think it’s worth giving it a go though, as mud cakes are pretty forgiving recipes in general. If you do give it a try I would love to know how you get on! Hello! I’ve been eyeing this recipe FOREVER and am finally ready to attempt after reading almost everything on your site 😉 I just want to confirm when you say “caster sugar” that it is powdered or confectioners sugar? Or just fine granulated sugar? Thank you so much for the help! Your site is SO informative…I love it! I have a wedding cake to make for a friend and would like to use this recipe, will it work three tiers, i am making a 10″ 8″ and a 6″ to stack with the ruffled butter icing and white choclate, ganache in the middle, just a little concerned it will be to heavy to stack all three tiers? Looooove this recipe – I’ve baked it several times and it’s always perfect, and a great base for decorating. Can you tell me if I swap the white sugar for brown sugar it will make a Caramel Mud Cake? I’ve been asked to make one and I know this recipe works so would love to use it again. This cake looks perfect for my GF daughter! I have read in other comments that it keeps well but I am unsure on how to “keep” the cake – if you know what I mean?! If I bake it on Wednesday for a Saturday party, how do I wrap it up? Should I trim and cut the cake into tiers before I wrap it? Should I ice the cake before I wrap it or should I do it on Saturday? The pressure of cooking a large birthday cake for a big family is real! Haha. Hi, I’m planning to make this cake this week. We live at 5800 ft elevation. Should we make any changes to the recipe to accommodate for the high elevation? Thanks! Yay, I’m so glad it worked out! Thanks for letting me know <3 If you try the devil's food cake I'd love to know how you get on. It's my favourite cake so I hope it works for you too! Just wondering if your oven temp is for a fan forced or convential oven? OMG Just what i have spent weeks/months scouring the net for! i cant wait to try this recipe out. I will be trying a Dairy free version. How far would this batch go or should I bake two x this recipe? Hi Kelly, yay, I’m glad you found it! It really depends on how you plan to cut the cake and what size portions you need, but as a rough guide this cake (7″ round, approx 4″ high) will give you 37 coffee-sized portions (1″ x 1″ x 4″ high) or 15 dessert sized portions (1″ x 2″ x 4″ high). It’s harder to work out for wedge-shaped slices, but that should be a rough guide. For 40 people I would suggest at least doubling it, either in two 7″ tins or you could bake the double mix in one 10″ pan if you’re ok with one large cake. Or if you wanted to make a tiered cake you should be able to bake the doubled mix in one 8″ pan and one 6″ pan. This recipe looks wonderful. I have been asked to make a gluten free white chocolate and raspberry cake for a friends wedding. Do you think this cake would work if I mixed through fresh raspberries into the batter at the end or even swirled through blended up raspberries? Hi Catherine. Yes, you can definitely add raspberry to this. Sometimes whole raspberries can sink to the bottom as it’s quite a runny cake batter, so I would suggest a combination of whole raspberries and blended raspberries. You can add a little of the cake batter to the blended raspberries before swirling it through in the tin, and then add some fresh berries as well. Alternatively, freeze-dried raspberries work quite well too, as they’re very light and don’t tend to sink as easily through the batter.